I was initially very disappointed with this book as it is not very much about algorithms. That might not be Hanna's fault as the title on the American edition is "How to be Human in the Age of the Machine". I still would have liked more discussions about different kind of AI:s and how they are shaped, as I think this is an area where more knowledge is needed to ensure a substantive discussion. But perhaps the book Hanna has written is needed before that discussion can happen. This book basically just state that AI have some skills, especially pattern recognition, classification and prediction. Given these skills it can do different things more/faster than humans, including mistakes. Hanna's main point form my perspective is to help us understand that we should apply the same ethics and thinking that we have always done. AI are a reflection of us and as such will always come with flaws. But also that it is the combination between humans and machine that tend to get the best results. So we should try to design systems based on how AI and humans work together. It is a noble goal, but I would have liked to see more discussions about how to increase the probability of that happening. What I lack is a specific discussion about the kind of flaws we need to look for in AI systems, and even more how to mitigate these flaws. There are a number of areas that could have been covered such as the role of the training data (if you only train your AI for detecting hands on white middle-aged men the AI will struggle to recognise a the hands of black young girl. Or if you only focus on the simple things that are easy to quantify and get the AI to look for, you will miss the non quantifiable aspects that are important. As a general introduction to the field for those who are "afraid" of computers and AI I think this book might be valuable. For those who wants to dive deeper this is not the book. Being critical in the same way as we always should be is the message Hanna leaves us with, and maybe that is what is needed right now, that we "stop seeing machines as objective masters and start treating them as we would any other source of power. By questioning their decisions; scrutinizing their motives; acknowledging our emotions; demanding to know who stands to benefit; holding them accountable for their mistakes; and refusing to become complacent. I think this is the key to a future where the net overall effect of algorithms is a positive force for society." Stephen Hawking is a well known icon for science, but I think he is less known for his wisdom. Hopefully this book will change this. He has been a supporter of so many of the most important issues of our time, bringing wisdom and guidance to everything from space exploration and the question of God to the existential threats facing humanity and the nature of intelligence. The book provides insights into a number of the grand scientific challenges of today when it comes to astrophysics, particle physics, and genetics. The focus is obviously astronomy, with emphasis on Hawking's work on Black Holes. He explores fundamental questions such as "how did it all begin", "what is inside a Black Hole", "is time travel possible", and "if there is other intelligent life in the Universe". He does not shy away from difficult issues, but he does not go into details (my only significant frustration with the book is that I think it should have benefited from a "further reading" part. 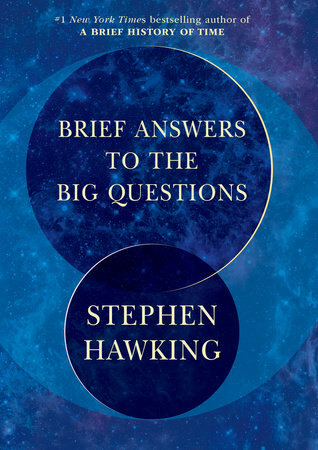 It does have an overview of Hawking's other books, but I would have linked to know what books Hawking would have recommended in the areas he covers in the book). This is however a small gripe with a book that is very short, and might possible best be read when each chapter can be discussed. My own bullet points where almost as long as the chapters. For someone who have spent time working with existential threats, i.e. those that threaten the very existence of our survival, it is refreshing to read someone who is bringing those to the forefront and also challenges us with some fundamental questions. Hawking manages does what anyone who is intellectually honest should do. He clarifies some basic facts, such as "We now have the technological power to destroy every living creature on Earth." He then provides some context for this situation, such as "Aggression, in the form of subjugating or killing other men and taking their women and food, has had definite survival advantage up to the present time. But now it could destroy the entire human race and much of the rest of life on Earth. A nuclear war is still the most immediate danger, but there are others, such as the release of a genetically engineered virus. Or the greenhouse effect becoming unstable." Instead of concluding in a doom and gloom scenario he brings in fundamental issues that are seldom discussed, such as "It is not even clear that intelligence has any long-term survival value. Bacteria, and other single-cell organisms, may live on if all other life on Earth is wiped out by our actions. Perhaps intelligence was an unlikely development for life on Earth, from the chronology of evolution, as it took a very long time—two and a half billion years—to go from single cells to multi-cellular beings, which are a necessary precursor to intelligence.". He is also honest when he is making value judgments and not stating facts such as "The Earth is under threat from so many areas that it is difficult for me to be positive. The threats are too big and too numerous.". This is great as it provides us we a platform for further discussions. This who say that the facts indicate that we are moving in the right direction have to answer what threats they dismiss or what kind of impacts they do not consider relevant. One of the most striking features is how Hawking's manages to move on timescales that sometime feels as if they are, if not extinct, a dying breed. In an age where people in media seriously talk about discussions on Twitter that come and goes in hours it is refreshing with an intelligent mind who look at things from at least a millennium, but often billion years, perspective. "One way or another, I regard it as almost inevitable that either a nuclear confrontation or environmental catastrophe will cripple the Earth at some point in the next 1,000 years which, as geological time goes, is the mere blink of an eye. By then I hope and believe that our ingenious race will have found a way to slip the surly bonds of Earth and will therefore survive the disaster. The same of course may not be possible for the millions of other species that inhabit the Earth, and that will be on our conscience as a race." I think it takes a certain mind to wander to the limits of knowledge and push beyond it. There is also a special kind of mind that moves freely in multiple dimensions. I think much of Hawken's brilliance when it comes to areas outside his specific area of expertise is due to the capacity to think long-term and put things in perspective. Hopefully this book will inspire people to think outside the box with regards to their normal constrains in time, space and ethical boundaries. "But what lies ahead for those who are young now? I can say with confidence that their future will depend more on science and technology than any previous generation’s has done. They need to know about science more than any before them because it is part of their daily lives in an unprecedented way. Without speculating too wildly, there are trends we can see and emerging problems that we know must be dealt with, now and into the future. Among the problems I count global warming, finding space and resources for the massive increase in the Earth’s human population, rapid extinction of other species, the need to develop renewable energy sources, the degradation of the oceans, deforestation and epidemic diseases—just to name a few. There are also the great inventions of the future, which will revolutionise the ways we live, work, eat, communicate and travel. There is such enormous scope for innovation in every area of life." It has perhaps never been a generation that have lived in a time with more significant challenges, but also there have probably never been a generation with more opportunities. If we can get more people to read books like this, I think we will increase the capacity to recognise, understand and address the challenges and also recognise, understand and capture the opportunities. Over the last 12-24 months the concept of “Ecological Civilisation” and the Belt and Road Initiative are finally moving into mainstream thinking and media. It looks like the end of 2018 and 2019 could see some transformative shifts due to these two concepts. The photos above are from three interesting events where these two topics have been discussed.